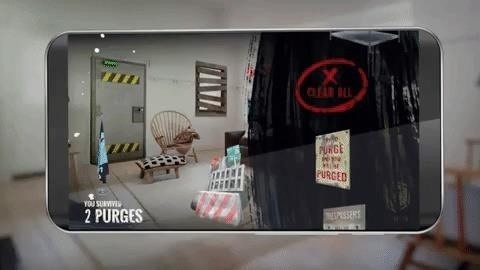 After four films, the dystopian horror The Purge is jumping to the small screen on USA Networks as a television series, but, if that wasn't enough to capture your interest, the network's parent company, NBCUniversal, has also published a mobile AR game. 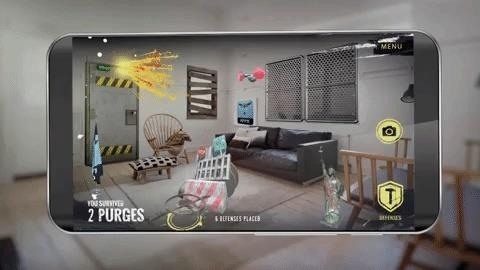 The Purge AR has been released for iOS and Android. The app uses horizontal and vertical surface detection found in current versions of ARKit and ARCore to scan the users' environment and enable them to place objects that people fearful for their lives might use to barricade their home from virtual anarchists. Once defenses are in place, users endure waves of unseen attacks from intruders. If the obstructions hold up, survivors can continue to fortify their position with increasingly stronger objects as progressively persistent waves of trespassers continue to try to get into the house. Augmented reality now ranks as a favorite marketing tactic for movie studios and TV networks, with sponsored experiences on Snapchat and Facebook AR promotions becoming commonplace in the last year. However, for its TV shows, NBCUniversal appears to favor standalone apps, with SyFy's Happy! and Forensic Detective: Inside the Crime Scene for the Oxygen network serving as recent examples. It's a logical approach, considering the fact that an app would likely fulfill the job of offering sustained promotion over the course of a TV season, whereas an opening weekend push via Snapchat may work better as a one-off movie opening promotion. Unity CEO John Riccitiello recently predicted that the first truly mainstream app would likely come from marketing and advertising. At the network's current pace of AR production, there's a decent chance that that app will promote an NBCUniversal TV show.